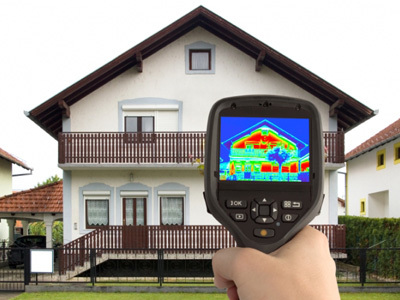 The thermal camera is an essential tool for building energy efficient homes and finding air leaks and missing or inadequate insulation in existing homes. A thermal camera is a tool that measures surface temperatures of walls, floors, ceilings, and other objects. It helps to detect areas of heat loss or heat gain in a home by making hot and cold spots visible. To provide useful information, the interior of the home should have a temperature that is at least 10 degrees higher or lower than outside. A thermal camera is particularly effective when used in conjunction with a blower door, which creates a pressure difference that enhances air movement around leaks. Air movement has a particular thermal signature, which can be easily spotted with the camera by an experienced user. The staff at Green River are trained and experienced in the use of a thermal camera and interpretation of the results, helping builders, homeowners and property managers to diagnose building performance issues. 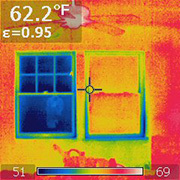 This thermal image shows two windows, side by side. The window on the right is a gas-filled double-pane energy-efficient unit which is maintaining the same temperature as the room, while the window on the left is an old inefficient single pane unit that is allowing heat to escape. 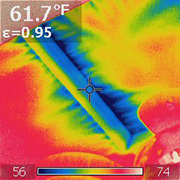 This thermal image shows cold attic air being drawn into the living space through gaps around the attic hatch during blower door operation.